"In 1860, J. H. Buckbee began selling the first trade-name banjos (Richelieu, p. 6). "The 5-String Banjo in North Carolina by C.P. Heaton, citing for authority Richelieu, p. 6; Bacon, p. 26; Krick, "The Banjo," The Etude, 56 (Mar. 1938), 192. 7. "How to Play the 5-String Banjo" (Beacon, NY. : Pub. by the author, 1961), p. 68. "In about 1897 two New York instrument makers, Lange and Rettberg bought the J. H. Buckbee banjo factory [383 Second Ave. according to "The Lange Banjo Ukulele"]. Buckbee of New York had been the banjo maker for many famous players, among them Farland, Foote, Converse, Bruno, Mather, H. Dobson and G.C. 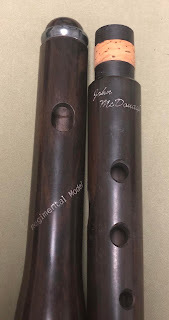 Dobson and produced banjos with the names of these performers as the manufacturer. Indeed, Buckbee had been the largest of the post-war banjo manufacturers and produced both handmade and mass produced instruments." "Notes on Orpheum Banjos", by Bill Reese. The first is a relatively plain brown wood drum and the other is an identical copy but dressed up with a gold eagle against a blue background with a banner reading, "Williamsport Rifles" (to be the subject of a future posting to this blog). And the other is an eagle drum, painted with a banner reading "Williamsport Rifles" (a whole other story).